Getting through customs and security is never fun. But there's a simple way to make it easier: Don't bring any bizarre or illegal things with you, and especially don't try to sneak 70 live finches hidden in hair rollers through. Also, if it doesn't go without saying, don't try to hide any tortoises either. But apparently this doesn't go without saying? 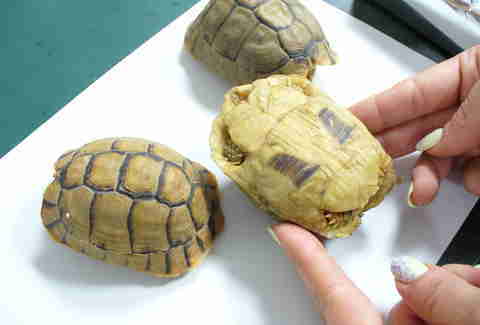 A 69-year-old man was recently caught trying to sneak three live tortoises through customs in Berlin. Which sounds ridiculous, yes, but you have to admire his ingenuity: He tried to get away with it by disguising them as pastries. This daring attempt took place on March 2 at Schönefeld Airport in Berlin, and, according to a report from The Local, the man had come from Cairo, Egypt. He attempted to leave the security area without declaring anything but was stopped by customs officers, who found a package that was clearly meant for pastries. But its contents looked off. When questioned, the man claimed the tortoise-shaped objects were just chocolates. 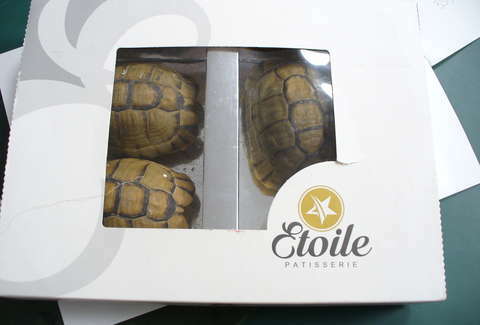 The officers weren't swayed, and upon opening the box, discovered three live Moroccan tortoises. Moroccan tortoises are protected by the Convention on International Trade in Endangered Species of Wild Fauna and Flora, aka the Washington Convention, and so were confiscated and placed in the care of the border veterinarian, according to The Local. The Federal Agency for Nature Conservation will now investigate the incident further. But looking at the packaging, maybe it was worth a shot?